In the off chance that some hardware company can't figure out what to get me for Christmas, here's a hint. It's a nice hardcover Army-issue notebook, about 5 inches by 7 inches and about a half an inch thick, full of what looks to be college-ruled paper. It's great for jotting down notes during a meeting or sketching diagrams to organize some disorganized thoughts. It doesn't weight more than a few ounces, I'm sure, and it weighs noticeably less than my 40-gig iPod. All-in-all, it's a great little recording unit. Its downfall is that it's inherently analog. I can take beautiful notes in it, but they're not fully indexed for quick searching. I can't re-order the pages without destroying the notebook. I can't upload notes or data from other sources quickly. I can't easily copy my notes and diagrams into an e-mail or a blog post. 1. My new device needs to have the same form-factor as my little green notebook. About 5 in. by 7 in. by 1/2 in. and no heavier than an iPod. It must open like a book and have a nice cover on it, preferably one that's customizable. I'm sure some people would like a nice leather cover and others would go for a sleek, brushed-metal exterior. 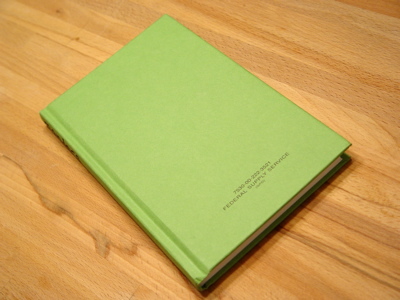 Personally, I like the simple, smooth book-style hardcover like on my notebook, but to each his own, I say. The book form-factor is important to me, since it has a built-in protection mechanism and as shown by the past few centuries, it's a great shape for just sitting around and reading. 2. I need to be able to write in it. Ideally, both open pages would accept writing, but if that's too hard or expensive, just the right side would be fine. If it's limited to just one side, the entire device should be able to be flipped upside-down for left-handers, since it would probably be more useable for them to be able to write on the left side. There's got to be some great handwriting-recognition software on there, too. Everything I write has be able to be quickly searched through and easily transferred as either the original handwriting or translated ASCII text to any other document on this device or my main computer. 3. Both open pages need to have very high resolution. I want to be able to sit and read from this device for hours with no more eye fatigue than I'd get from reading a regular book. 4. I must be able to upload entire books and easily navigate them, search through them, and make notes in them. Since I can read from this for hours, I need something to read. This device will replace the fiction books I bring on the commuter train and the technical books I use at work. 5. It must store and play my entire music collection. I'm fine if it just handles MP3s, but integration with the iTunes Music Store would be nice. And while you're at it, integration with the other major music stores would be excellent. Oh yeah, support Ogg Vorbis, too, for the the Slashdot crowd. 6. The device also needs to make phone calls, send and receive e-mail, and browse the web, all without forcing me to jump through a cellular company's hoops. This might be done by having wi-fi access of some type and doing voice over IP for the phone calls. I'm not ready to move to Japan or Korea to be able to hook up with a phone company that can handle modern technology. 7. It needs to support wireless peripherals of all kinds. It can be Bluetooth or whatever, but I need to be able to use wireless headphones, phone headset, keyboard, mouse, fancy digital pen, and anything else that might be of use. 8. It must easily sync up with any common computer a user may use: Windows PC, Mac, Linux, etc. 9. Its pre-loaded software needs to include a text editor for note taking, a calendar, an e-mail client, a fully functional, modern web browser (Firefox, perhaps), a book reader that can handle all common document formats, a music player, and a fast search engine, along the lines of Apple's Spotlight. 10. The device's operating system must be open, such that I can easily install any third-party application I want to use. Interested developers must be free to create any applications they want, without having to license any expensive SDKs. Even better, it could run Linux and a world of applications would be just about available right from the start. Ok, that sounds easy enough. Oh, I forgot to mention, the battery needs to last at least 8 hours if the user is just reading or taking notes. Using more advanced features can reduce the battery life a bit, but it better not be by much. And, it needs to cost less than $1000 and under $500 would be even better. So there you go, hardware companies. Get to it. Christmas is almost a month away. Luckily, my wife is also in the Army and I have a military I.D. card that states that I belong to her. That was good enough for the USPS, and I successfully returned from my mission with the package underarm. I don't think her I.D. card has any reference to me, though, so she still wouldn't have an easy time picking up a package addressed to me. The lesson here? Marry a soldier. Or better yet, somehow end up with the same last name as your spouse when you get married. A fledgling business that I helped start a few years ago, Tidal Gardens, has just got a funding shot in the arm. Than Thein, the owner and a friend of mine from my previous job, won $30,000 in a business plan competion, capturing the grand prize in the Start Up category. Tidal Gardens, Than Thein, president -- The Akron-based company specializes in the propagation of live coral for saltwater aquarium enthusiasts. Company founders have a deep appreciation for the natural reefs, and through their work encourage a self-sustaining hobby that no longer requires the collection of corals from the ocean. My part of the business was setting up and programming the website. My current job has lead to me being far too busy to be a productive part of the team, so I finished up his online storefront and handed it over to him. The current version can be found at tidalgardens.com. As of this writing, the store portion of the site has not launched yet, but it will most likely be open before year's end. According to Cleveland's Plain Dealer, Than will "use the prize money to revamp his Web site and add to his inventory of coral." It will be exciting to see his site finally launch after a few years of stop-and-go preparation. It will also be interesting to see what direction the website heads in when it's in someone else's hands. Congrats and good luck, Than!